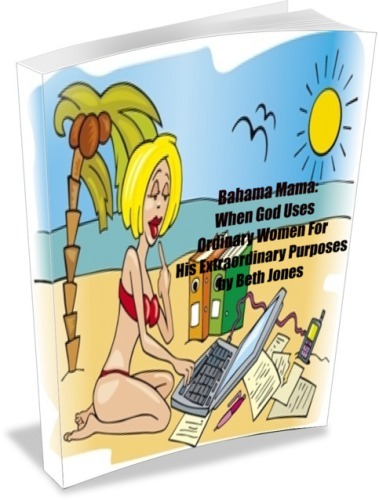 T hank you so much for buying my ebook, Bahama Mama: When God Uses Ordinary Women For His Extraordinary Purposes. I pray this ebook encourages and inspires you to fulfill your great purpose and destiny! After your purchase, you will receive an email from me to confirm your subscription with your name and email address. Please confirm this so you will receive your email with the ebook’s download link. Please do not share this link with others, as it is a private link. I’m really excited about chatting with you on our private Spreecast live event, coming up soon. Be sure to add my email address elizabethdjones@gmail.com to your email contacts list so you’ll get all the latest info! Thank you so much for your business. I appreciate it! If you have any questions or comments about the ebook, you can email me at elizabethdjones@gmail.com. Be sure to check out my other products at my Estore at www.bethjones.net/beth-jones-estore/.